A supporter of Jair Bolsonaro salutes during a celebration in front of his residence after he was declared the winner of the election runoff, in Rio de Janeiro, Brazil, on Sunday. Brazilian far-right politician Jair Bolsonaro â" a retired army captain who has expressed admiration for dictatorship, repeatedly denigrated women, gays and minorities and decried "fake news" â" has become the country's new president. With nearly all the ballot counted, Bolsonaro leads his opponent, Fernando Haddad, by a comfortable margin. The country's biggest news channel, Globo, has already called the election for Bolsonaro. "I was never alone. I always felt the presence of God and the force of the Brazilian people," Bolsonaro said, speaking to supporters outside his home in Rio de Janiero. The Associated Press writes, "Later, he said in a Facebook Live transmission that he had received a call from some world leaders, including U.S. President Donald Trump who wished him good luck." White House press secreta ry Sarah Sanders later confirmed Trump's phone call. Bolsonaro, who was stabbed and seriously wounded last month by a would-be assassin â" has styled himself as an outsider, despite a 27 year career in the Congress and used his campaign to channel popular anger over corruption, an ailing economy and rising crime rates. Going into Sunday's runoff election, Bolsonaro enjoyed front-runner status after emerging first in a field of 13 candidates in an election earlier this month, well out ahead of Haddad, who won the second-highest number of votes. As NPR's Philip Reeves reports, "This is the biggest change in the political landscape of Brazil since the end of military dictatorship in 1985. The 63-year-old Bolsonaro is veteran congressman who admires those dictatorship years." 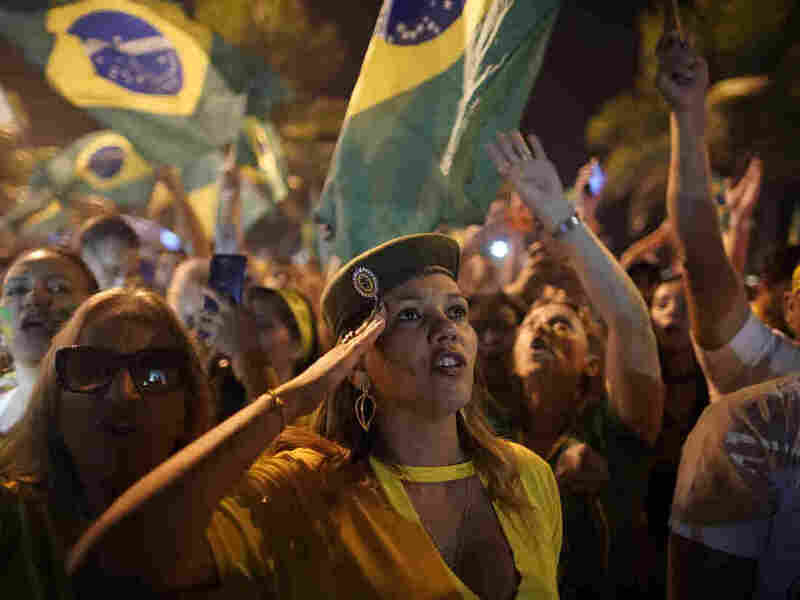 Thousands of supporters turned out in the streets of Rio and Sao Paulo to cheer Bo lsonaro's victory. "I feel in my heart that things will change," Sandra Coccato, a 68-year-old small business owner, told the AP after she voted for Bolsonaro in Sao Paulo. "Lots of bad people are leaving, and lots of new, good people are entering. There's a light at the end of the tunnel." Haddad said his supporters "have the responsibility to mount an opposition, putting national interests, the interests of the entire Brazilian people, above everything." "Brazil has never needed the exercise of citizenship more than right now," he said.